It's definitely been a while since I've made one of these! Somewhere along the way of Fashion, Love, and Martinis' growth, I felt like I could not post without an outfit to share, news to break, or video to film. What happened to the days of sharing my life experiences with just words, no pictures or video needed? Creating such standards for myself pushed me away from blogging. Even writing in my journal became a bit much. To be honest, I can barely recall the last time I cracked open my ruby red Smythson. To lose my enthusiasm for blogging/writing really threw me for a loop because I've loved the art since I was a kid. To misplace my passion for it, even if it was temporarily, really made me question the motives of my blog. I got so caught up in feeling restricted about what I could post that I forgot why I started my blog in the first place. I created Fashion, Love, and Martinis in November of 2008 not only to show my style, but to reveal my lifelong relationship with my health and body -- and those that butted in on that relationship from time to time. It's time to get back to basics. Don't fret; this doesn't mean the death of outfit posts or videos. It means the birth of a better blog. 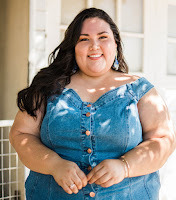 A blog where I can share my past and present experiences, personal style, and advocacy for self acceptance and fashion at any size. I hope you'll join me for the re-birth of Fashion, Love, and Martinis. If you don't, just remember this: I never let my weight, size, or the number on a tag dictate my self-worth and style. I hope you will do the same.